First published on harpersbazaar.com, April 2014. Reprinted with permission from Joyann King. 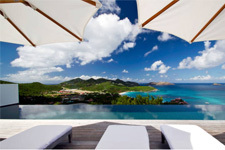 How to Get There: St Barths is a great escape for any East Coaster. Hop an easy flight to San Juan, then you simply take one of Tradewind Aviation's daily flights to Gustaf Airport. Less than an hour in the air and you will be landing on one of the most thrilling and gorgeous runways I have ever seen. Tradewind makes the whole process effortless with their private-like lounge in San Juan, on-board spirits (a glass of Veuve is a must with the heart-racing landing) and well-trained, friendly pilots. I met two of the owners of Tradewind while on my trip (both of whom are named David) and their passion for aviation and travel was contagious. You are in safe hands here - besides, the thrilling flight is half the fun! Where to Stay: While there are a myriad of hotels on the island, the real experience comes from staying at a villa. 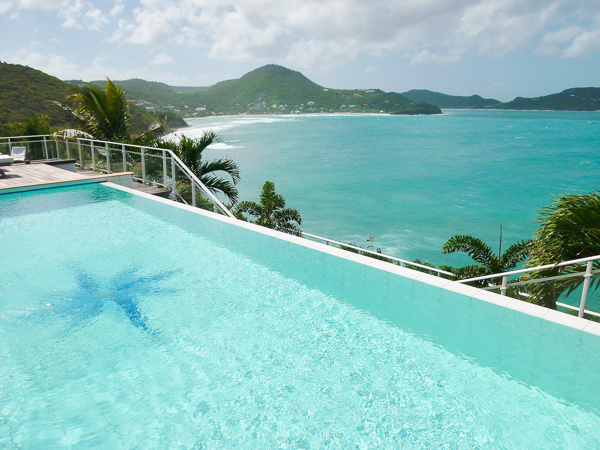 To wake up to the gorgeous sunrise and have coffee by your private infinity pool, then later watch the rising moon at night with a cocktail in hand, is when true relaxation really sets in - a must when in St. Barths. WIMCO Villas, which has over 300 villas on the island (they also own gorgeous ones in St. Tropez), is the ultimate resource for finding the perfect home for your liking. Upon landing we were greeted with our 24-hour concierge (ours was a dutiful, lovely man named Moe), treated to a fully-stocked fridge of Maya's To Go (more on that below). I stayed in Villa WV BEN in Pointe Milou (also known as "Festiva") where I was treated to glorious sunsets, quiet mornings and cooling breezes. WIMCO scheduled private massages by Ligne St. Barth at our villa, and we were also lucky enough to take an exclusive tour of some of the most stunning homes on the island a few days into our trip. The architecture is truly inspiring. Where to Eat and Drink: We had a lovely rosé filled lunch at Do Brazil, which is right on the water. Maya's To Go is great for stocking up for a house party, while the restaurant is great for delicious, classic Caribbean fare. We also enjoyed dinner outside at Bagatelle, which overlooks the dock and is great for boat-watching. Sunset drinks or lunch at Nikki Beach is an island right of passage, and so is a super late night spent partying at Le Ti! Otherwise, enjoy stocking the kitchen from the amazing French markets and bakeries, where cheeses that cost $20 in the U.S. are under $5 and the baguettes and almond croissants are perfection.